Richard Hammond explains physics in this popular, award-winning series, from the discoveries of ancient Greece to Einstein via Galileo and Newton. Physics doesn't just happen in a lab - it happens in the kitchen, in your bath, in a car! All About Physics shows you how science affects everything, from roller-coasters to fighter pilots. Join a thrilling high-energy journey through time, space and beyond and find out about the physical forces that make our world what it is. Experience some "light" reading about waves and the electromagnetic spectrum; get stuck into friction; and feel the heat with temperature. You can also find out the answers to age-old scientific questions such why the sky is blue, and to more obscure conundrums, such as why golf balls have dimples. 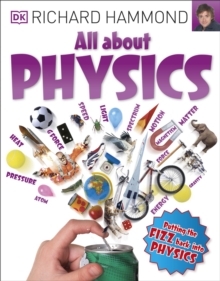 Crammed with fascinating facts and interactive experiments, this book is a totally cool look at physics!